For Detroit Tigers fans and for baseball fans in general, Hank Greenberg is remembered as one of the greatest players in Tigers history. For Jewish baseball fans, Greenberg’s stature is even greater as a hero for young men and women seeking to succeed in Protestant dominated America. Greenberg was an inspirational figure the first American League player to enlist in the Army following the passage of the 1940 Selective Service Act. He was inducted on May 1, 1941 and much was made of Greenberg’s patriotism in the baseball press. On December 5 he was discharged following the Congressional decision to release all men over 27 from the service. Two days later came the attack on Pearl Harbor. Greenberg reenlisted in early 1942 and served until the end of the war. In 1938, Hank Greenberg had a career year in baseball and challenged Babe Ruth’s record of 60 home runs in a season. He finished two short of Ruth’s home run total, and he led the American League in runs scored with 143 and 119 walks. The 1938 season and the challenge to Babe Ruth’s record is the focus of the book. Kaplan offers a detailed analysis of the season and Greenberg’s quest for the record. Interwoven into the narrative is the anti-Semitism of the times, as well as Greenberg’s encounters with that reality of life in America. After recounting some of Greenberg’s family background and his youth, Kaplan launches into what is effectively a game-by-game account of the season and the home runs. At times, this part of the narrative gets bogged down in more routine detail than is needed. The pace and strength of Kaplan’s account picks up considerably in the last few chapters that cover the climax of the season from late August and through September. It is at this point that the challenge to Ruth’s record begins to be noticed by the sportswriters. As a consequence, Greenberg finds himself spending more of his time responding to reporters, and the pressure of chasing Ruth begins to build on him. The strength of Kaplan’s account comes from his analysis of the anti-Semitic environment in which Greenberg lived. As Greenberg approached Ruth’s record some analysts believe that there were those in baseball who didn’t want to see a Jew break the record, and that, as a result, he was pitched to differently than earlier in the season. Although not totally dismissing this conspiracy theory, Kaplan offers several other explanations for Greenberg’s decreased home run rate in the last weeks of the season. More might have been done to explore the anti-Semitism of the times and its impact on Greenberg. For example, it is likely that Greenberg was denied admission to Princeton University because he was Jewish. Following that rejection Greenberg attended New York University for a year and then signed a professional contract with Detroit. Kaplan might also have offered a bit more on the paradox of Hank Greenberg’s employment by Henry Ford, and whatever relationship there was between the two men. But then the focus of the book was the 1938 season. If on the other hand you want to relive some of the everyday drama of the 1938 season, Ron Kaplan’s account will fill the bill. In the end, the final third of Hank Greenberg in 1938 is much stronger than the earlier section. 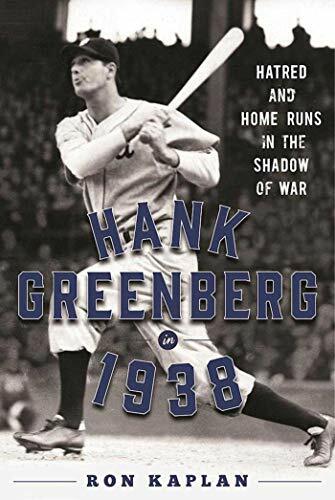 Hank Greenberg’s life is much more interesting and significant than the 1938 season alone, and for those interested in that larger life there are good biographies and an autobiography from which to choose. Richard Crepeau has written numerous fiction reviews for the Orlando Sentinel. He is also Professor Emeritus at University of Central Florida where he taught sports history and is author of NFL Football: A History of America's New National Pastime.